On 17 September, 2018, the Special Economic Zone in Duqm (SEZAD) celebrated the operation of the passenger terminal at Duqm Airport after completion of all the construction plans of the airport to be the third operational airport in Oman after Muscat and Salalah International Airports. HE Dr. Mohammed bin Nasser Al-Zaa'bi, CEO of the Public Authority for Civil Aviation (PACA), stressed the economic and tourist importance of Duqm Airport, which operated in 2014 as a temporary terminal. In a statement to the press during reception of the first flight to use the new terminal, he stated, "The new terminal shall be an addition to the Sultanate in general and SEZD in particular through supporting the economic, tourism and social movement. The airport supports various projects, whether industrial, tourist or commercial, expressing his hope that the airport will activate the economic movement and link with Duqm Port and the Dry Dock leading to the support of the logistics side, increase air and sea freight traffic and freight transport. He pointed out that most of the air transport agreements signed between the Sultanate and the world countries, such as the bilateral agreements or open skies, included all the airports of the Sultanate, and since Duqm airport operated in 2014, it is part of these agreements. Al-Zaa'bi indicated that Oman Air is studying methods to link the airports of Muscat, Duqm and Salalah in the near future. The total cost of Duqm Airport was about OMR 90 million, of which OMR 38 million of the last package, which included the passenger building, the control tower, the air cargo terminal, and the meteorology and air traffic center. Duqm Airport operated in 2014 through 4 weekly flights using Embraer Aircraft, and as the traffic increased, the type of aircraft changed to Boeing 737 and the number of flights increased to 6 flights per week. It is expected that the number of passengers through Duqm Airport this year would be 45,000 passengers compared to 34,000 in 2017 and 24,000 in 2016. 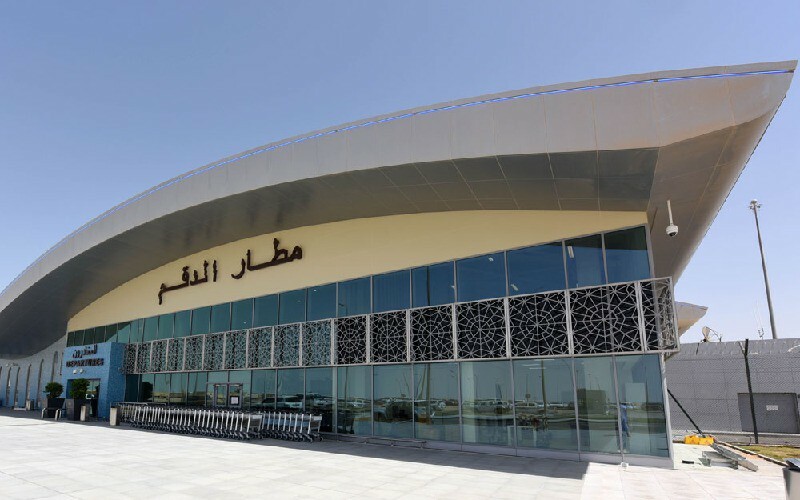 "The operation of the new passenger terminal at Duqm Airport is a qualitative leap among the projects that have benefited the governorate, particularly with the existence of SEZD, which embraces mega projects," said Sheikh Mu'adhad bin Mohammed Al-Yaqoubi, Governor of Al-Wusta. He expressed hope that these projects would create more jobs for youth, develop their capabilities and possibilities, and enrich the economic movement in the governorate, stressing that these projects, especially strategic projects, such as airports and ports that have a direct positive impact on the community and small and medium enterprises. For his part, Sheikh Ayman bin Ahmed Al-Hosni, CEO of Oman Airports Company, said that the company is currently working on attracting international airlines to operate their flights through the Sultanate's airports, including Duqm Airport, through participating in international conferences and exhibitions on aviation and tourism. Dr. Khalfan bin Said Al-Shuaili, CEO of Oman Aviation Services Company, stressed the economic and social importance of Duqm Airport. He praised the government's efforts to promote and develop the aviation and aerospace sector in the Sultanate through investment in various airports that have the capacity and potential to meet the needs of investors, tourists and citizens. Al-Shuaili said that the operational readiness tests carried out at Duqm Airport during the last period proved the high efficiency of the airport capacity to accommodate the movement of aircraft, passengers and freight with modern and advanced systems, such as bridges, aircraft pushing and baggage handling devices, besides other services inside the airport. He stressed the importance of regional and international marketing in light of its strategic location with its ability to receive various types of aircraft. Eng. Yahya bin Khamis Al-Zidjali, Secretary of the Tender Committee at SEZAD, and the Planning and Projects Officer in the Office of the Chair, said that Duqm Airport will add a beautiful icon to anyone who wants to reach this region and will encourage businesspersons, investors and contractors to come easily. He added that the region is witnessing a radical transformation with an integrated airport that will provide many services to investors, local community, tourists and visitors, adding that the airport plays a prominent role in supporting the projects of SEZD and Al-Wusta Governorate in general. Al-Zidjali added that Duqm Airport was implemented in accordance with the latest international standards in airports. It is also been equipped with modern systems of communications, information technology, security surveillance systems and navigation and meteorological services, enabling it to deal with various incoming flights both from inside and outside the Sultanate. The airport's capacity is estimated at half a million passengers a year, with the potential to expand to 2 million passengers a year.